I did finish the couching and am posting from afar…I am still watching nature go by, but I spoke too soon about our wonderful temperatures. Summer is here with a vengeance; hot temperatures and humidity. 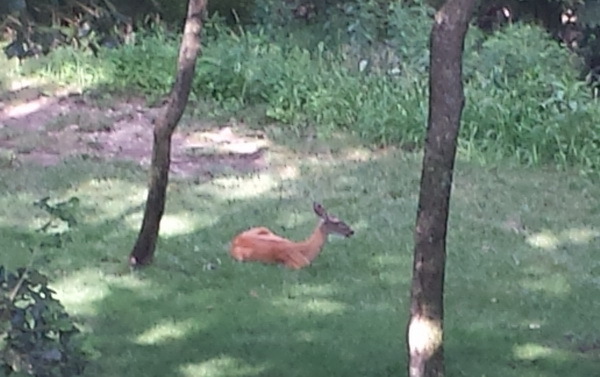 Even this doe doesn’t want to move much. I hope after this week I will be able to finish up some of those half-done projects I have been creatively avoiding. I like Anne’s term “Creative Avoidance’; if it were a disease (and it may be), I have a terminal case of it! 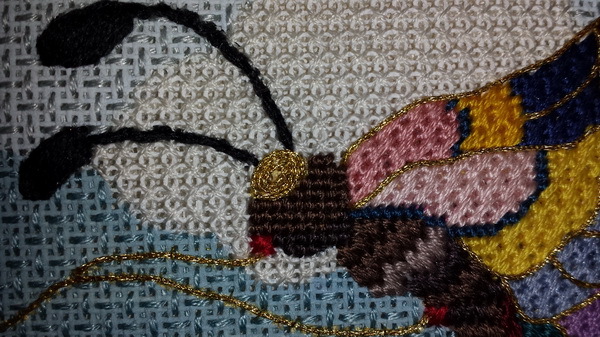 After I finished the clouds and sky I added the antenna to the butterfly I decided a Wrapped backstitch was better than couching. And then on the lower part of the butterfly (red outline) I made a small cording or twist on the canvas and couched it in place. I make my cording or twist on the canvas and DO NOT turn it back on itself, but rather twist until I get the twist I like, I also use a few extra ply or a larger thread since I am not turning the cording/twist back on itself. . I find this much easier that trying to turn it back on itself and getting the proper length I need. 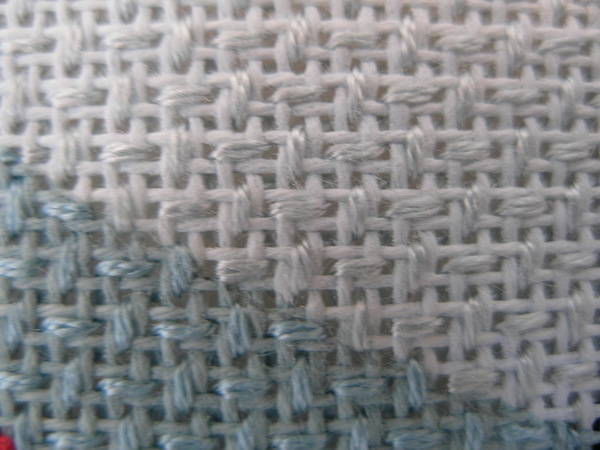 I start couching at the ends brought up through the canvas and stitch toward the open ends of the twist. This way if I need to twist more I can. When I get to within an inch of the ending I plunge the open ends of the cording/twist threads to the back and hold in place under where my couching will continue so I can catch and secure these ends. 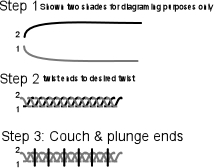 When I am through couching I plunge couching thread and secure cording/twist even more. When I laid the cording twist out for the initial placement I realized that I was not going to be able to coil this at the end of the tail so I did a Cross Stitch over 1 thread and then placed a tiny Jessica around this. Then I plunged the cording/twist under this stitch area. 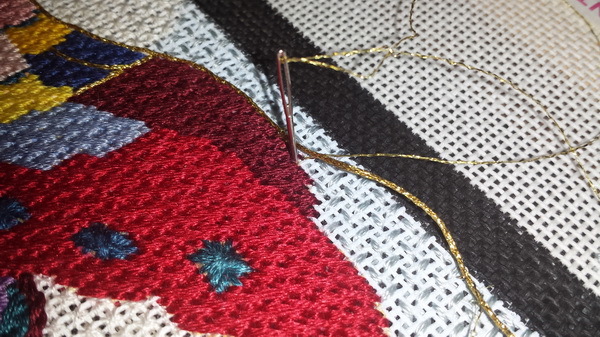 Lest you think I was trying to cop-out of couching…all the gold is couched using 0023 Kreinik Japan #1 for the couched thread and Accentuate Gold to couch in place. I like to couch from the outside toward the stitching. I think it makes for a soother line and I can control those little opps areas that I always seem to have. 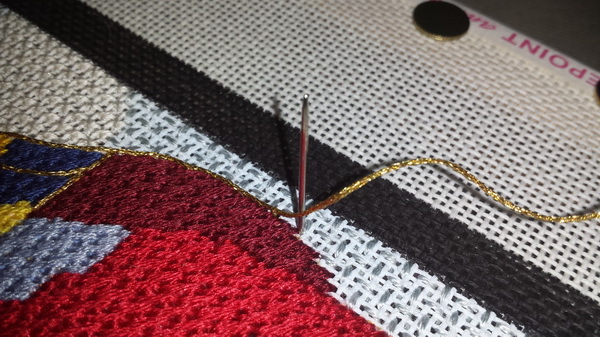 Notice that when you are couching either the red twist or gold some planning has to go into the placement of these threads. I did the upper red cording /twist before I did the lower red twist. See the picture for the order of placement for the red and gold. And the shorter kite string was couched before the longer one. I even thought of bring the gold back out under the child’s hand and letting it hang free; but decided against this for wear reasons. I did not want it to maybe accidentally get pulled and mess up other couching or just begin to wear poorly and then I would not have rest of couching secured well if I cut it off. 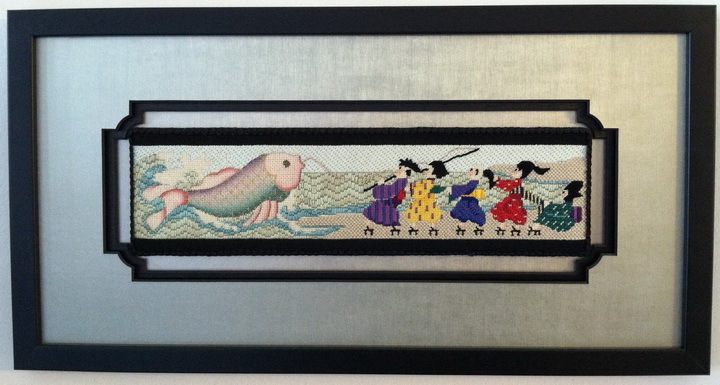 I have decided to frame this piece after all and am not going to stitch the black bands but have it matted in a black mat with a gold bamboo frame. I can see this, just hope I can find the gold bamboo for the framing. The Children with a kite was a former guild members canvas and threads and I hope that as Jessie is looking down from her golden cloud in heaven, she likes the way I stitched it. 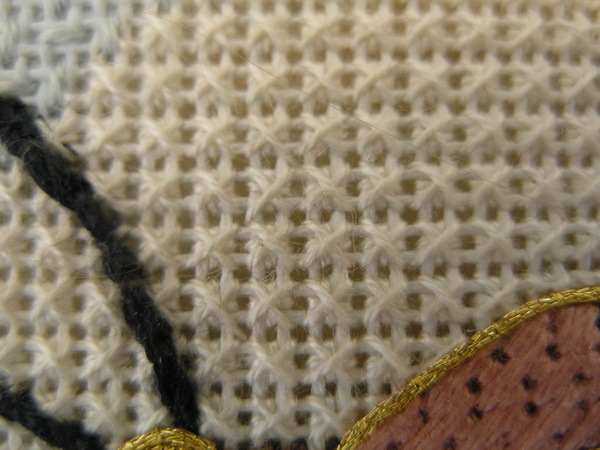 Thank you for stopping by… I hope you find time to stitch today…I am! I decided to do the cloud in a traditional Smyrna Cross using #12 White perle Cotton. I wanted the clouds to have a little puff but not enough that the butterfly would sink into the cloud. compensation (although I think I forgot and did compensate in a few places (BUT if you are close enough to see these, you are too close to the needlework…please back away.) I have to finish the sky and especially around the butterfly. So I think I’ll stitch behind the kids first and then I won’t be tempted to stop and play with couching on the butterfly. Hopefully by the end of the week I can have this piece ready to be blocked. And next week is when I hide out at my niece’s house…my big job is to let the dogs out three times a day and watch the wildlife in her back yard. I spend the rest of my time watching old movies and stitching…no work just relax and watch the wildlife and dogs. And I have several other pieces in the works I want to get to stitch this summer too, so I am taking one of these with me. I am doing the same stitch throughout. Nobuko and I would compensate as needed. The aqua and red dots will be Rhodes stitches to fit area. 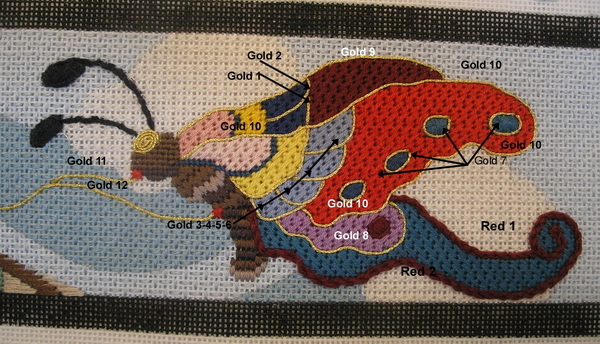 Butterfly body is going to be Gobelins, his topknot will be couched gold, and the antennas will be left for couching too (Rhodes stitches for the ends of antennas too). Color choices are dark values for back wing and light values for front wing. These are also the colors used in the kids clothes. I also decided to take a close up picture and I would later go back and couch the gold and red outlines. Then I realized I will have to stitch the cloud and sky before I couch the butterfly. Since this is going to be a HOT week-end (I think summer has finally arrived in the Midwest USA…but gratefully it has stopped raining); it will be a great week-end to stitch. Why do you stitch canvases? When you buy a canvas do you think what the finished product will be? You should but few of us do. We are impulse buyers and this is good for shop owners but not always wise for us. There is just so much wall space that pictures can occupy. And even though I love my dog to bits, I do not like her using my needlework pillows as her lounging chair. And when are stand-ups & ornaments too many, not to mention where you store them all? So next time you go to buy that canvas, please think about the finished product; what will it be, where will it go, where will you store it if you need to do this and who will get it (if it is a gift)? All good questions and if you can’t answer them, then you might think about another canvas…because we all know that we have to purchase a canvas to maintain our mental stability. And visiting a shrink is more expensive and it will take you too long to get an appointment, so find a canvas you can see finished (someday), you can live with and then by all means… purchase it. Do you ever buy previously owned canvas? Sometimes these canvases come with threads and stitch guides too. They can be from Susie Stitcher who is no longer as excited to stitch the canvas as she was when she purchased it; it can be from a guide member who is downsizing; or an estate sale of a former member. While I have purchased a canvas or two (less than 6) from an online auction company; I like to buy directly from the original owner, I like the connection to the stitcher. I prefer to purchase something from a guide member at an estate sale for a couple reasons: 1. It gives that person a portion of her investment back or 2. It reminds me of that guild member who is no longer with us. I have several of these and each time I stitch one I remember this lovely stitcher and how much I enjoy(ed) her company. This is one of those canvases, and when I got it out to stitch it I wondered how she had meant to finish it. I’m guessing a picture, but I do not know for sure. I asked on Facebook: Needlepoint Nation Group how I should finish this piece (https://www.facebook.com/groups/NeedlepointNation/search/?query=sue%20dulle) and received many responses: bolster pillow, box, black lacquer box, top for a new stitching bag; basket band, top of a chair back, door draft stopper, hat band, eyeglass case, table runner, top of a mirror, tray insert, coat rack inset and a stand up. At first I thought I would learn to make a box, then I thought top of a tote bag or a bolster pillow, but after stitching on it I’m not sure. The canvas is an older canvas from Melissa Shirley Designs. I think it has been retired; but when I contacted Melissa Shirley Designs (http://melissashirleydesigns.com/)for permission to use photos, she had some great advice for those of us looking for an older canvas. She suggested you contact your local shop and have them check with the designer; they sometimes have a back stock or will be willing to paint a special order. There were at least two others if memory serves me well; one was with a fish and the other I do not remember. Thank you Barbara Cohen for sharing one of the other pieces that are in this series. The piece is lovely and I do like the framing too. . Does anyone remember the other design canvases in this series? Maybe I should check and see if the others in this series are still available… Oh my gosh, I am enabling myself! This canvas I purchased from a guild members estate was kitted with silks and so I decided to use these…there were some stitch suggestions from the shop that chose the threads but I decided to wing it on my own. First I took a picture of the unstitched canvas. I always try to do this as a reference to the canvas; I print this as a reference only. AND I do not keep them after I am finished stitching and shred these pictures as they are not my designs. I try to remember to ask permission of the designer to use pictures of the design in my blog too. I’m not always good at this; I guess I think all of you who needlepoint and read my blog are honest. I did contact Melissa Shirley Designs and obtained permission for two of her canvases. And then feeling guilty, I contacted some other designers I plan on stitching and received their permission too. I Basketweaved all the children’s skin and most of their outfits; the exceptions were the small decorative stitches and they were either Reverse Basketweave, Cross over 2 threads one direction, Cross stitch over 1…whatever fit the area. Their backpacks or ribbons were mostly Diagonal Goblins to fit. I decided to have some fun with the hair and so three of the children have padded, hair, I think they call this Shimada hairstyle [https://en.wikipedia.org/wiki/Shimada_(hairstyle)]. 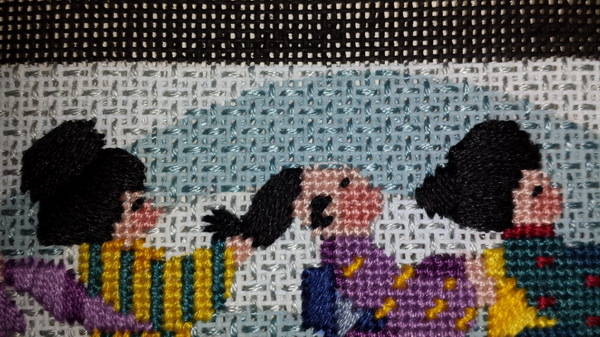 The second child from the left just had wild hair… Random Straight stitches; while the second child from the right had a more controlled hairdo using Straight stitches in a more controlled method. The shoes of the children were a combination of Cross stitches to fit; the heels and straps were Elongated Cross stitches to fit. I spent an evening perusing for a grass stitch I liked. I chose #Grass 27 from Stitch Landscape from Little Shoppe Canvas Company (http://littleshoppecanvascompany.com/books); your local shop should be able to get this helpful little book for you. 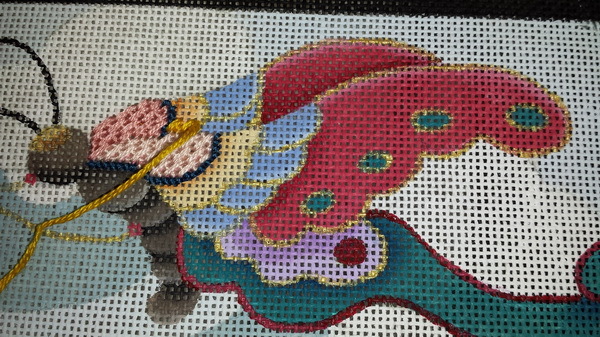 Next I am going to stitch the butterfly…and then the background. I still am undecided about how to finish this but maybe it will come to me as I stitch.